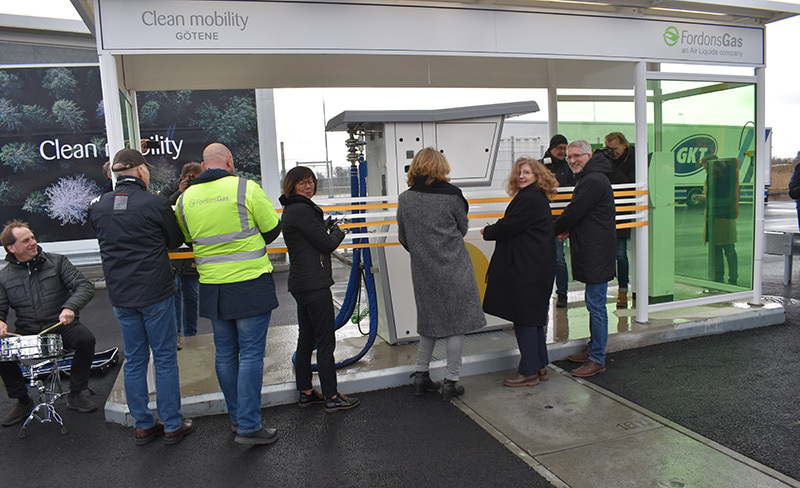 Sweden´s first liquid biogas station has opened today in Götene within the framework of the environmental initiative Klimatklivet. A rapid expansion of infrastructure for liquid biogas fuelling now awaits – a necessary condition for switching heavy traffic from fossil fuels to renewable energy sources. FordonsGas Sverige AB, the country´s leading company for biogas for motor vehicles, is behind the new fuel station and sees the facility as symbolic for the upcoming development. -The investment support from Klimatklivet has really provided a boost for our sector, says Emil Glimåker, CEO of FordonsGas Sverige AB. The more investment we have in environmentally-smart, gas-powered heavy duty and the more fuel stations we can establish, the more swiftly we will manage the changeover to sustainable transportation. Construction of the station in Götene is possible because of the road carrier Götene Kyltransporter, which is now investing in up to 50 new heavy duty trucks that run on liquid biogas (LBG). -Liquid biogas is the future – of that we are certain, says Dennis Karlsson, CEO of Götene Kyltransporter. Other fuels will not suffice when we want to offer our customers fossil-free and sustainable transportation. Volvo Trucks sees the transition from diesel to liquid biogas as an important condition for acheving Sweden´s environmental goal of reducing carbon dioxide emissions from transport by 70 per cent by the year 2030. -The new LBG station in Götene is a good example of the collaboration and desire among all parties involved to achieve Sweden´s challenging goals, says Lars Mårtensson, head of environment and innovation at Volvo Trucks. Liquid biogas plays an important role in the change- and now we expect a rapid expansion of the infrastructe. These key players are working together in the collaborative project Västsvensk arena för flytande biogas, managed by CLOSER. -We are pleased to see how well the project has succeeded in connecting the entire chain, from biogas production to vehicle manufacturers and distributors to freight carriers and transport customers, says Helena Holmberg, Vice President of the Regional Development Committee in Region Västra Götaland. Time for inauguration! Ulf Johansson, owner, GKT, Anders Melin, FordonsGas, Susanne Andersson, Götene Municipality, Helena Holmberg, VGR, Eva Svedling, Government Offices, Lars Mårtensson, Volvo Trucks. Spreading information about development and new technology is an important part of the project. -Liquid biogas, LBG, has great potential in contributing in the change to sustainable transportation. Monitoring and verifying it with scientific methods is very exciting, says Karl Jivén, researcher in charge of the system analysis carried out by the IVL Swedish Environmental Research Institute. Biogas is a completely renewable fuel produced from biomass – often organic waste – and consists primarily of methane. Liquid biogas, LBG, is one of the most promising alternative fuels today for a fossil-free vehicle fleet and is particularly well-suited for heavy traffic for which there are few other energy alternatives available. Västsvensk arena för flytande biogas is a collaborative project between industry, academia and the society. The project members are Biogas Väst, Region Västra Götaland, FordonsGas, Gasum, Volvo Trucks, Chalmers University of Technology and the IVL Swedish Environmental Research Institute. The project is managed by the CLOSER at Lindholmen Science Park, the national arena of cooperation for shared transportation efficiency. Klimatklivet is an investment support for local and regional measures to reduce emissions of carbon dioxide and other gases that affect the climate. The effort is part of the state budget approved by the Swedish Parliament. Do you want to be a part of the CLOSER collaboration? Arranged by AI Innovation of Sweden. Arranged by Floe, VINNOVA and Lund University.